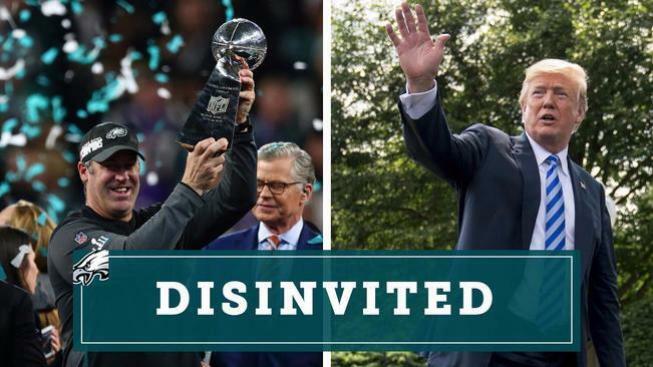 Trump said Eagles fans are invited to the White House "to be part of a different type of ceremony"
President Trump rescinded the White House visit for the Eagles, citing player boycotts and national anthem protests for his reasoning. Now the fans are weighing in. Editor's Note: On Tuesday, Malcolm Jenkins fired back at President Donald Trump after the White House doubled down on its decision to disinvite the team. Read more here. Less than 24 hours before the Super Bowl champion Philadelphia Eagles were set to visit the White House, President Donald Trump rescinded their invitation over what he says is a disagreement on standing during the national anthem. However, none of the Eagles players took a knee during the anthem in the 2017-2018 season. The Associated Press reported Trump was furious when he learned only a few players were expected to attend the ceremony, and ordered aides to scrap the visit, believing a low turnout would reflect poorly on him, according to a White House official not authorized to discuss internal conversations publicly. One report said only 10 players had been expected to attend the ceremony. The Eagles said it planned on traveling to Washington, D.C. as a “team trip” during which some players would attend the White House event while others worked in the community or visited with lawmakers. The Eagles canceled the team trip to the nation’s capital and will stay in Philadelphia for an expanded voluntary practice Tuesday. Trump's head-snapping decision was announced late Monday evening in a short statement painting the team — whose mascot is also the United States' national symbol — as unpatriotic. "[The Eagles] disagree with their President because he insists that they proudly stand for the National Anthem, hand on heart, in honor of the great men and women of our military and the people of our country," Trump said in a statement released Monday evening. "The Eagles wanted to send a smaller delegation, but the 1,000 fans planning to attend the event deserve better." Trump said Eagles fans are invited to the White House "to be part of a different type of ceremony — one that will honor our great country, pay tribute to the heroes who fight to protect it, and loudly and proudly play the National Anthem." The event, which will start at 3 p.m., is named the "Celebration of America," according to the White House schedule. Trump tweeted Tuesday morning that "we will proudly be playing the national anthem and other wonderful music celebrating our country today ... Honoring America! NFL, no escaping to Locker Rooms!" He also listed the championship-winning teams that have visited the White House recently. Late Monday night, the Philadelphia Eagles released a statement on Twitter. "It has been incredibly thrilling to celebrate our first Super Bowl Championship," they wrote. "Watching the entire Eagles community come together has been an inspiration. We are truly grateful for all of the support we have received and we are looking forward to continuing our preparations for the 2018 season." After the Eagles statement, Trump sent another tweet. "The Philadelphia Eagles Team was invited to the White House," he wrote. "Unfortunately, only a small number of players decided to come, and we canceled the event. Staying in the Locker Room for the playing of our National Anthem is as disrespectful to our country as kneeling. Sorry!" 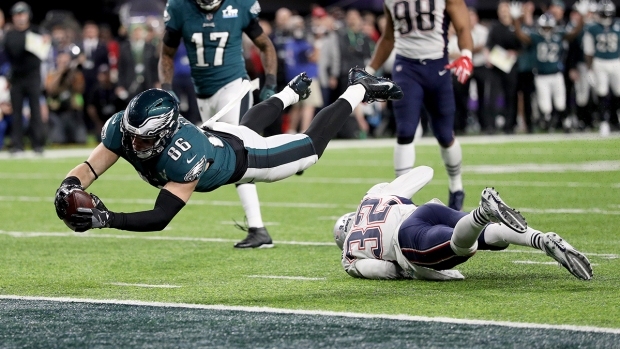 After the Eagles victory in Super Bowl LII, several players said they would skip the visit. Safety Malcolm Jenkins, wide receiver Torrey Smith and defensive end Chris Long all said they did not plan to attend. "At this point in time, there's so much that's been kind of swirling around that administration, I don't see it as beneficial at this moment in time to visiting in a celebratory fashion," Jenkins said last month. "But I know for a fact that there are other guys who have dreamt of the opportunity to go to the White House and I think they should have that opportunity." Among those who were looking forward to visiting the White House were head coach Dough Pederson and quarterback Carson Wentz. The White House did not immediately respond to questions about what had sparked the last minute decision and why the circumstances were different from other events honoring winning teams, which some players have boycotted. Eagles owner Jeffrey Lurie is considered one of the more liberal owners in the NFL. He gave money to Hillary Clinton’s presidential campaign and reportedly called Trump’s presidency “disastrous” in a closed-door meeting. When asked about the possibility of a White House visit back at the owners meetings in March, Lurie didn’t want to talk about it. The first time the Eagles acknowledged the visit to the White House was in April, when they said they were working through the logistics of a trip to D.C., where they were hoping for an “opportunity to engage in productive dialogue with the leaders of our country." Swirling at the forefront of the rescinded invitation is the president’s strong stance against demonstrations during the national anthem. Jenkins has been one of the most outspoken anthem demonstrators — he raised his fist — but stopped his demonstration last year when the NFL and his players coalition helped create an agreement that pledged $90 million toward social justice issues. Demonstrations by Eagles players differed slightly from displays that have most incensed Trump — those who took a knee during the national anthem. Not one Eagle took a knee during the regular season last year. Jenkins and others opted instead to raise a fist. This marks the second time Trump has disinvited a championship team from making the traditional White House visit. The president rescinded an invitation to the Golden State Warriors last year after star player Stephen Curry said he probably would not attend. In response to the canceled White House event, Philadelphia Mayor Jim Kenney called Trump "a fragile egomaniac obsessed with crowd size and afraid of the embarrassment of throwing a party to which no one wants to attend." "City Hall is always open for celebration," he wrote in a statement.